Not sure what to wear for the big day? Wear whatever you want! Seriously though, it’s your big day, and there’s no “correct” attire for a beautiful wedding in Hawaii. Whether you have a vision of an elegant gown or a casual aloha-print outfit, it’ll all work as long as it’s something you love. 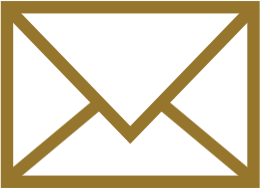 Here are some pointers from our experience that may help you figure out what works for the two of you. 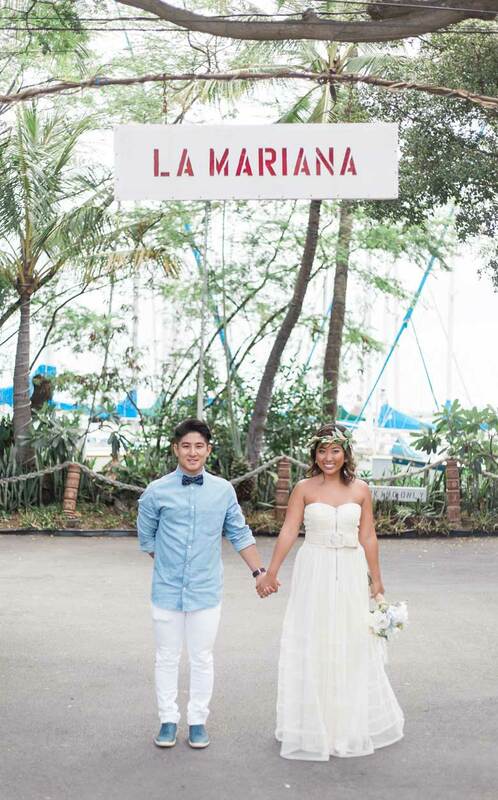 Many of our couples have worn formal attire for their beach wedding. Gentlemen have rocked three-piece suits or tuxedos and ladies have donned elaborate ballgowns. This couple knows how to dress! Keep in mind, Hawaii has warm weather year-round, so it isn’t always comfortable as formal attire is often made of thicker materials and fabrics. Even though a beach wedding tends to be a more casual venue, you can still get dressed to the nines. Proving that casual can look amazing! This can be a good option for couples who want to be a bit fancy for the day but perhaps not completely dressed up. There are lots of options for dresses; tea length and maxis are popular options. Slacks and a collared button down works well, maybe even adding a bow tie, vest, or suspenders for a bit more formality without a jacket. For our grooms, a short sleeve button downs and khakis are a comfortable option. A Tommy Bahama style shirt or aloha print can be a nice way to stand apart from any guests. As for the brides, sundresses come in all types of varieties so find one that fits your personality. Casual attire is often the most comfortable as it’s typically cooler materials. Sometimes physically being comfortable helps the couple relax a bit more which is always a good thing. Ladies, regardless of what kind of outfit you have, for footwear you’ll want to plan on flats. 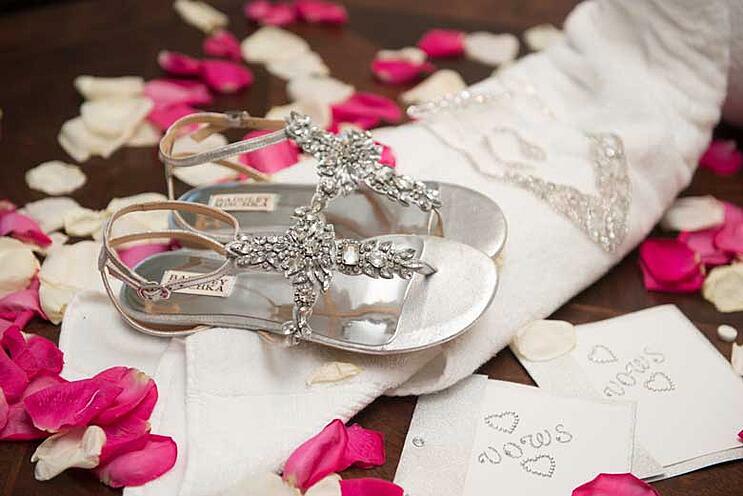 Most formal dressed are floor-length anyway, so a cute pair of rhinestone sandals or flip flops will work well. Heels, even wedges, can be very difficult to navigate in the sand. To avoid taking a spill as you walk down the aisle, plan on practical rather than pretty. If you have a pair of heels you have to have photos of, bring them with you and plan to change for a few shots. Flats are the way to go in Hawaii! Barefoot ceremonies are also popular choices. Walking through the sand is often easier without footwear so you can always plan on flip flops and remove your footwear at most of our recommended locations. You may want to consider “barefoot sandals” as a fun alternative to flip flops or being completely barefoot as it can add a little flair to your look. Whatever you choose to wear, as long as the two of you match the level of “dressiness” with each other, it’ll look fine. 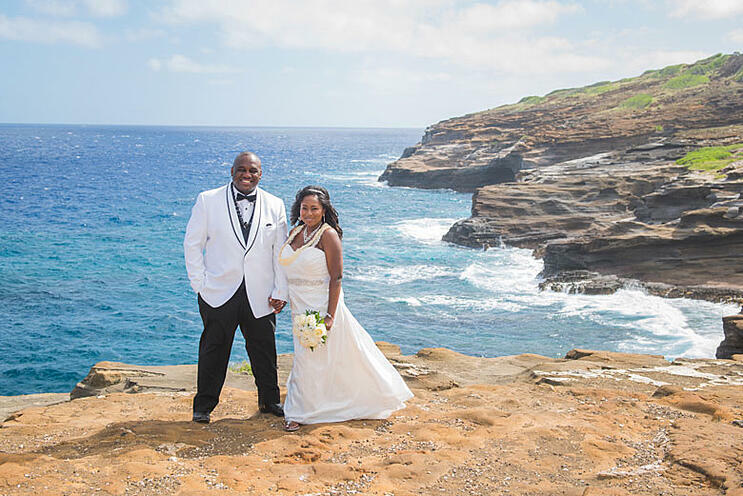 One of the best things about a Hawaii wedding is there are no rules, no standards, just your vision for your day. Find clothing that makes you feel good because it’s one of those things that can make a big difference. As long as you like what you’re wearing, you can’t go wrong! 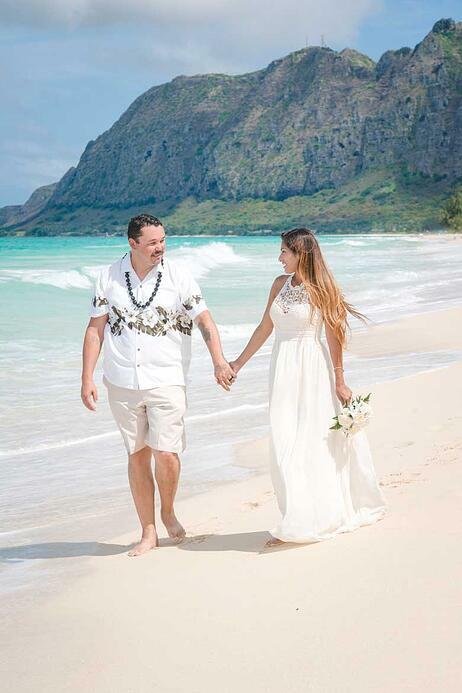 For more great Hawaii wedding attire ideas, follow us on Facebook!